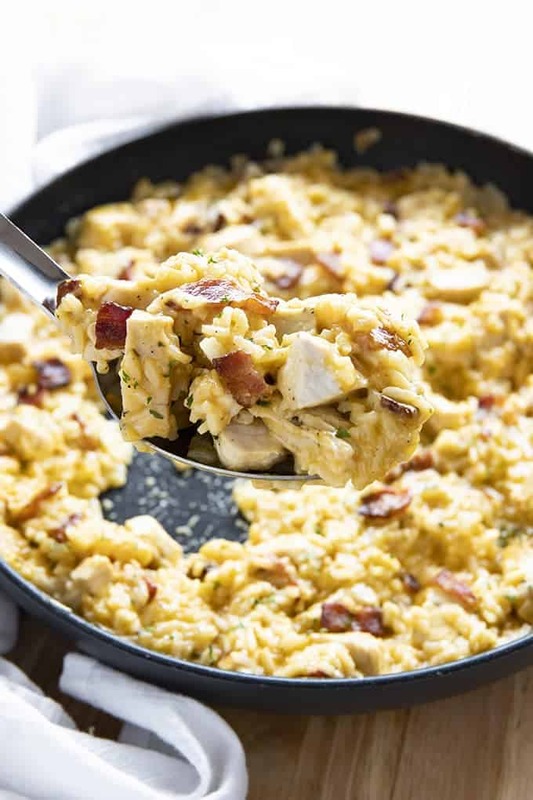 Bacon Ranch One Pot Chicken and Rice – The easiest and most flavorful chicken and rice recipe ever! Packed full of juicy chicken, crisp bacon, ranch, rice, and gooey cheese! 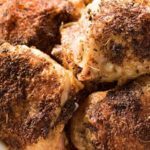 I’m back with another amazingly crave-worthy chicken and rice recipe! 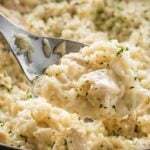 You guys have gone crazy for my Creamy Parmesan One Pot Chicken and Rice so it was time to mix it up with another fun recipe. One of my all-time favorite things to do is take a classic just like chicken and rice and “revamp” it into something new. There are so many flavor possibilities when it comes to chicken, and this is one of our new favorites! Like most of my One Pot Recipes this comes together really quickly, with everyday ingredients, using only one pan. 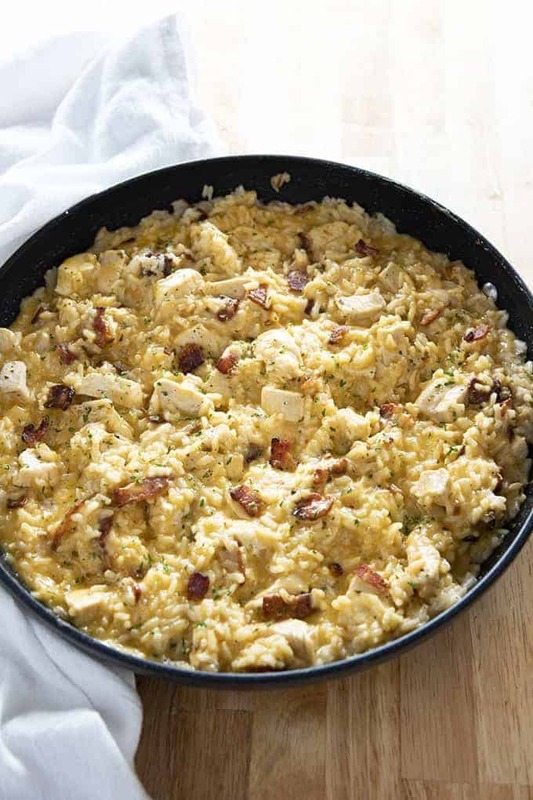 This dish is full of diced chicken, diced bacon, onion, garlic, ranch seasoning, and cheese…and of course, rice! I typically dice up my bacon first. While that is cooking, I can give it a stir every once in a while and prepare the chicken and remaining ingredients. A note, I like to use freshly shredded cheddar cheese. I find that it melts in so much better than the pre-shredded bagged stuff. Of course, you can use whichever you have readily available. 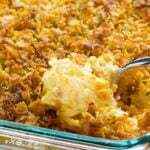 You will want to use a large (12 inch) skillet that has a lid for this recipe. Or, you can also use a good sized pot or dutch oven with a lid. The first step is to cook your bacon. We like our bacon a little more on the crispy side, but, you can cook it to your preference. Then, remove the bacon to a paper towel lined plate for later and wipe any grease from the pan. 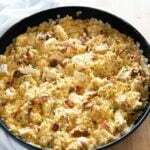 It is best to use long grain rice for this recipe, not minute/instant rice. If you use quick cooking rice, it will cook too quickly and become mushy. Any long grain rice will work! Most of the cooking time for this one pot chicken and rice is completely hands off! You will have downtime of 17-20 minutes while the rice and chicken cook. I use this time to make a simple side salad or some green beans to go along with this dish. 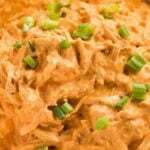 Bacon Ranch One Pot Chicken and Rice - The easiest and most flavorful chicken and rice recipe ever! 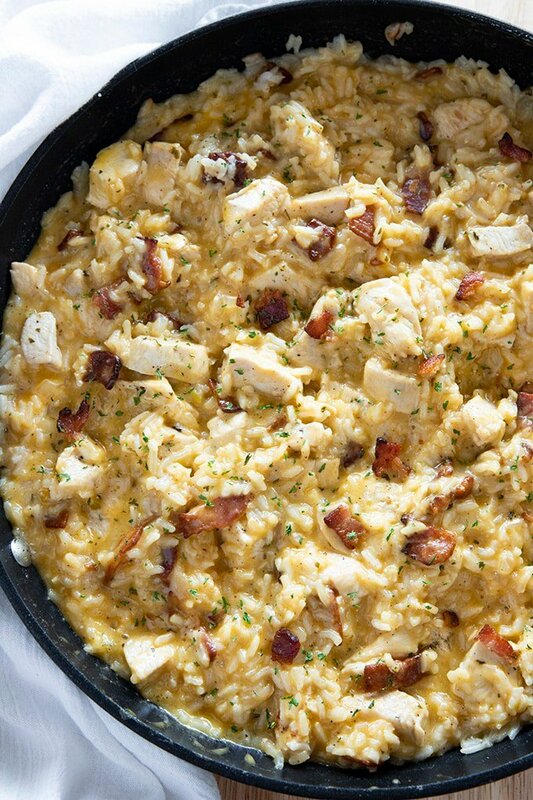 Packed full of juicy chicken, crisp bacon, ranch, rice, and gooey cheese! Cook the diced bacon in a large skillet over medium-high heat until cooked through. Remove bacon from pan to a plate using a slotted spoon. Wipe any excess grease from the pan. Add the onion, chicken, and seasonings to the pan. Cook until chicken is golden brown on all sides. Add the rice, ranch mix, and chicken broth to the chicken mixture. Bring mixture to a boil then turn heat to medium-low. Cover and simmer for 17-20 minutes until rice is tender. Turn off the heat and stir in the cooked bacon and cheese until melted. NOTE: I recommend seasoning with salt and pepper to taste. However, because the bacon and ranch mix tend to be salty, I typically only add pepper and no extra salt to this recipe. Would I be able to incorporate ranch dressing instead of a seasoning packet?? ? thanks! Hello! This sounds fantastic. 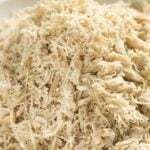 Is there a modification that i can make it in my instant pot? I made this tonight and it’s pretty good. I definitely don’t think you need 1 large onion. Next time I make this I will only use half of a medium one. I also add frozen broccoli to mine and enjoyed that. Thanks for the recipe! Delicious! All five of my kids liked this. Two of them normally won’t eat rice, and they both had a second helping! This is now on my two week rotation because the fam enjoyed it so much! 3 boys, 4 with the hubs and everyone is happy! I had A left over garlic/butter rotisserie that needed to be used . The chicken was well seasoned so I omitted the ranch,otherwise I followed the recipe. It was a hit , not to mention fast ! I will be using the recipe as it was written next time ! 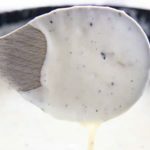 Would this recipe work well to freeze? And would it work using whole grain brown minute rice? I made this for my family tonight and they loved it! Thank you! 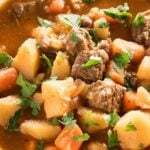 Do you happen know what the nutritional values are for this recipe? Did I miss in the recipe where you add the bacon back in? Before or after the rice cooks? Thanks! After the rice is cooked when you add the cheese into the pot. PERFECT weeknight dinner! Making for my family soon! Awesome! 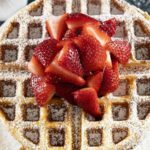 I love everything about this looks so tasty and so easy to make, this is a winner! Oh, I love rice! This looks amazing! I cannot wait to give it a try. YUM! You totally had me at bacon. What an inventive meal. One pot meals are so great for busy weeknights! This one looks amazing! I wonder if you could double the chicken and still get it all cooked through in 20 minutes.